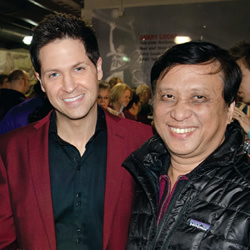 It is rare to find anyone in Indonesia who is a really true fan of Gaither music, but my dad, Yono (pictured right with Wes Hampton), has been the biggest fan of Bill Gaither and his music since he was a teenager. He has more than 100 DVDs, and he plays one of them almost every day. He really wanted to watch the live tour in person, but it would take 24 hours of flight to get to the U.S., which seemed impossible because of his health. In December 2011, I completed a Master’s Degree program in the U.S., and I found that there was a Gaither Christmas concert near the day of my graduation. My family prayed that God would give Dad the strength, health and opportunity to visit the U.S. for my graduation and the Gaither tour. God answered our prayers, and on December 16, after multiple flights and lots of driving, we arrived at the event in Columbus, Ohio. I had never seen my dad that happy before, and I believe it was one of the most amazing moments in his life. He was smiling all the time, singing along and really enjoying the show. He told me, “It is really a dream come true.” At the end of the show, he met Wes Hampton and had his picture taken with him. I believe this happened not because of his or our strength; it is because God loves him and He gave him an amazing Christmas present last year.